Oh, What Fun! 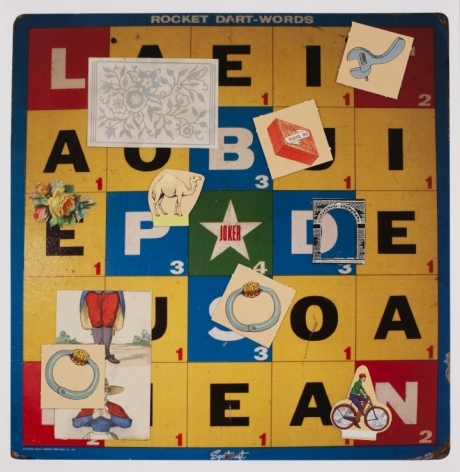 consists of a group of works inspired, as with his previous collages, by Ashbery’s long held fascinations, many since childhood, with cartoons, movies and other forms of popular culture. 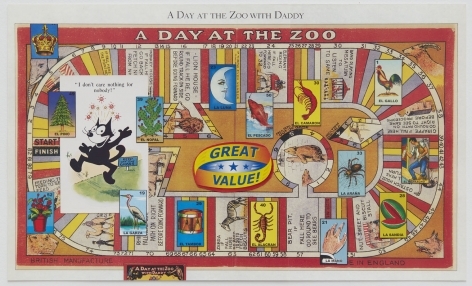 Much of the imagery and source material is culled from his personal trove of collections, such as board games, French puzzle plates, old postcards, and other treasured knickknacks that fill his homes in Manhattan and Hudson, New York. 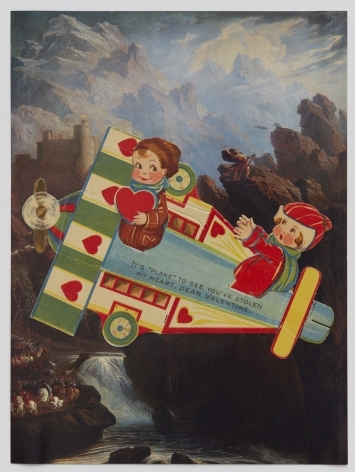 Ashbery became interested at a young age in surrealism, particularly the collage novels of Max Ernst and the work of Kurt Schwitters and Joseph Cornell. 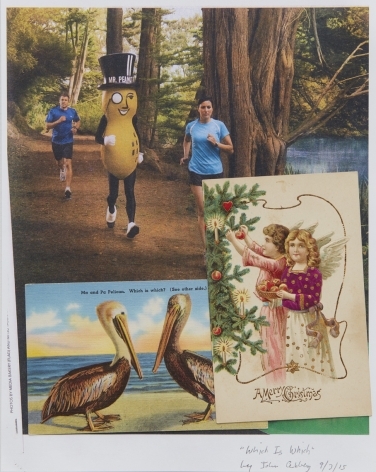 A more direct and collaborative influence was his friend Joe Brainard, at times making collages side-by-side with him in Brainard’s house in Vermont and sharing found materials for future collages. 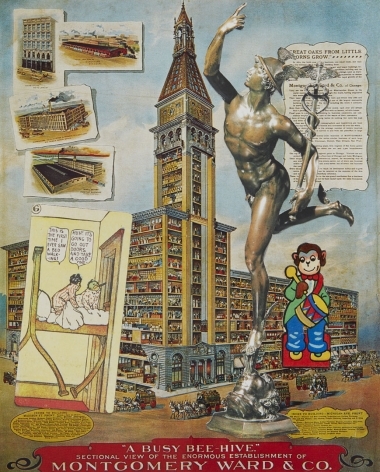 Although Ashbery started making collages as an undergraduate at Harvard, with one appearing on the cover of the Harvard Advocate in 1948 (a collaboration with Fred Amory), he first publicly exhibited a single collage in a group exhibition at the Drawing Center in 1977, it is only in the past decade that his collages have become more widely known. 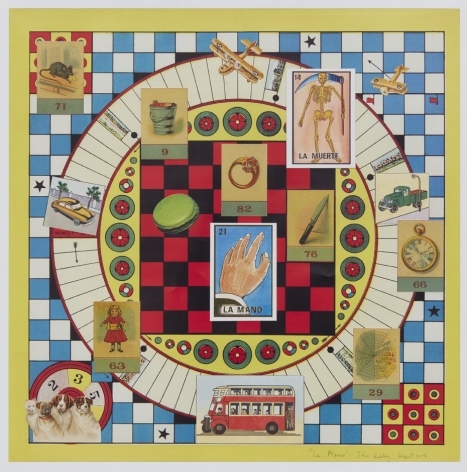 The exhibition also celebrates the poet’s long association with the gallery and marks the 65th anniversary of the publication of Ashbery’s first volume of poetry Turandot and Other Poems, which was published by the gallery’s Tibor de Nagy Editions in 1953. 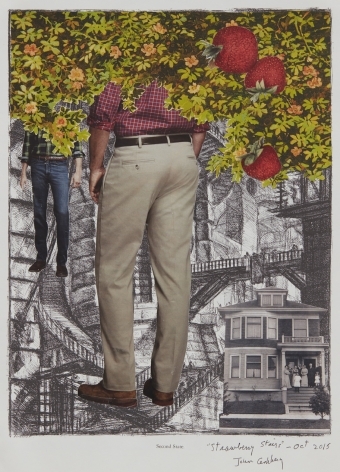 Concurrent with the gallery’s show is a major exhibition of Ashbery’s collages at the Pratt Institute's Manhattan Gallery (link) titled John Ashbery: The Construction of Fiction, which opens on September 20, and runs until November 14, 2018. 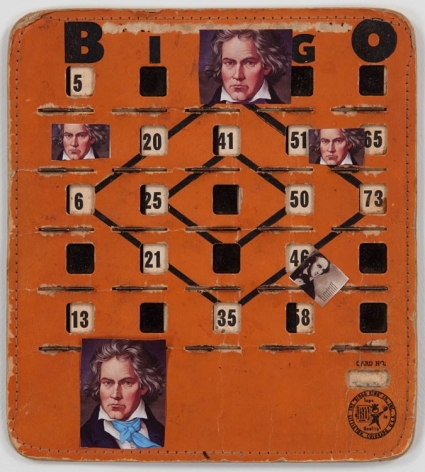 This will be the most comprehensive exhibition of the poet’s visual art to date, spanning seven decades of work and presenting over 120 collages and archival material. The exhibition is curated by Antonio Sergio Bessa, Director of Curatorial Programs at the Bronx Museum of the Arts. Bessa, who co-organized the recent Martin Wong exhibition at the Bronx Museum and the Gordon Matta-Clark exhibition at the Jeu de Paume, Paris, is a scholar of concrete and visual poetry and a translator of Brazilian poetry. A fully illustrated catalogue will accompany the exhibition. 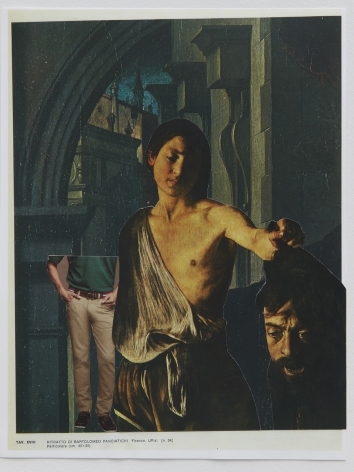 A book on John Ashbery’s collages and poetry was recently published by Rizzoli/Electa – John Ashbery: They Knew What They Wanted, Poems and Collages, edited by Mark Polizzotti, with an introduction and interview by John Yau. John Ashbery (1927-2017) had more than thirty collections published in his lifetime. His Self-Portrait in a Convex Mirror (1975) won the three major American prizes – the Pulitzer, the National Book Award, and the National Book Critics Circle Award. He served as executive editor of Art News and as an art critic for New York magazine and Newsweek. He was a member of the American Academy of Arts and Letters and the American Academy of Arts and Sciences, he was a chancellor of the Academy of American Poets from 1988 to 1999. He received two Guggenheim Fellowships and was a MacArthur Fellow from 1985 through 1990. In 2012, Ashbery was awarded a National Humanities Medal by President Obama.